Builders Cape Coral - The first thing you need to look at before hiring a builder for your home is their financial stability. 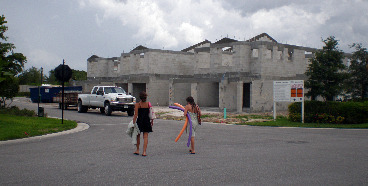 Cape Coral had quite the building boom going on in the early 2000's. But when the economy went under, many builders went out of business. That was a problem if you had anything wrong with your house that would've been fixed under a warranty. Some think it's a better value to buy a short sale or foreclosure, but you may need to pay cash if you want to beat out investors. If you can't purchase a home with cash, then consider having a house built. Construction loans are back, now that the economy is improving! For the recommended builders Cape Coral has in different price ranges, I have a list below, but before that, I want to mention Sandoval, Cape Coral's popular and beautiful gated community. You will find high-quality and well-designed homes built by Pulte, DR Horton, and Taylor Morrison. As of 2014, only Taylor Morrison is building homes in Sandoval ......... all other builders have sold out and those homes can be bought as resales. Sandoval was not hit by the economy as badly as the rest of the city and building is booming in the community. Low End - Adams Homes has been in business since 1991. They target first time home buyers, young families, and those wanting to down-size. The company's goal is to "provide affordable homes for each of these groups...to provide homes with style." Every once in awhile they will have a Cape Coral Fl Homes Sale Event. Mid End - Paul Homes has been in business since 1985 and they pride themselves in not only building a home, but also building relationships with their clients. Their philosophy is to "build homes of the finest quality and true value for our clients". High End - Aubuchon Homes has been in business since 1999 and they specialize in luxury homes. Aubuchon Homes strives to ensure that "every aspect of the homebuilding process reflects their high standards of quality and excellence." For remodeling, I recommend using Aubuchon or William Rummel Homes. They have been in business for over 20 years. They also specialize in tiling and painting, and will build new homes. I got to know them because they built the most beautiful house next door to the house I was renting when I first moved to Cape Coral. To avoid getting ripped off, hire only licensed builders and contractors. Just ask to see their license, they should also have their license number on their truck advertising.